Didn't really get to see much graffiti or street art in Dubai, other than this little act of vandalism in an apartment block in the Al Qusais neighborhood. This character (who almost has a resemblance to Homer Simpson) seems to be the United States Postal Service spokesperson (he's drawn or printed on a USPS label) in and around the Rutgers University campus in New Jersey, USA. 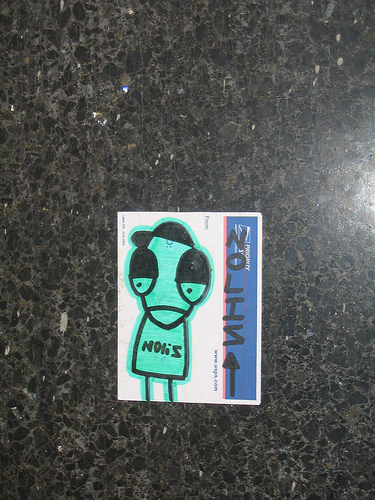 His name is signed as 'Nolis'. This blog takes off from where my original WordPress blog 'Fakirs & Dragonslayers' ceased to move on. I had not posted to it for quite a while and now have taken the opportunity to utilize the convenience of doing three blogs from the wonderful TypePad and sort of hopefully update on a super collection of street art, grafitti, sculpture and other stupid and super-duper graphical characters that I stumble across. I love this simple piggy face on a telephone hub (or it could be even electrical) that I come face-to-face every day on my way to work. He's on Handy Road (which is off of Orchard Road) near The Cathay cinema mall. Singapore is quite strict on vandalism and graffiti and that sort of free public expression. For an ultra-clean island nation where you feel like you are constantly being watched over by big brother, this piggy face gives you a reason to smile on your way to work every morning. Sort of like piggy is watching out for you.